The festival of Diwali became even more special for filmmaker Karan Johar with the presence of his daughter and son Roohi and Yash. Karan has so far shared a couple of pictures of his twins on the social media and this time the babies got to celebrate the festival with a few colleagues of Karan. 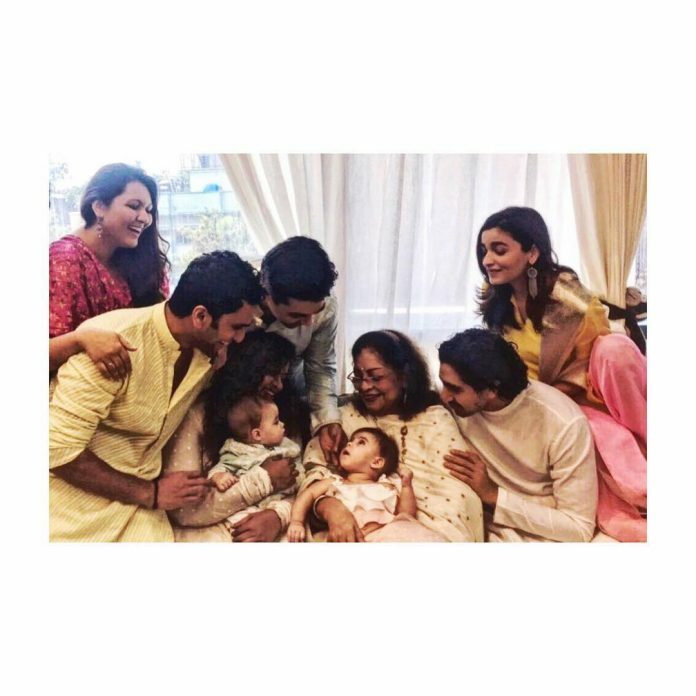 Team of Student of The Year Alia Bhatt, Varun Dhawan and Sidharth Malhotra were at Karan’s residence to meet the little ones on October 19, 2017. The actors also celebrated the completion of five years of the film Student of The Year. Varun and Alia posted a few adorable pictures with Yash and Roohi. One of the pictures on Instagram saw Varun holding Roohi in his arms and had the caption, “#love #roohijohar”. The Badlapur actor shared the same picture on Twitter and wrote, “Loveeeee with the most beautiful girl in the room”. Alia Bhatt shared a picture of the entire team of SOTY as they posed candidly with the twins. The picture has shown Karan’s mother Hiroo Johar, Ayan Mukherji and Karan looking adorably at the little ones. Karan also shared a still from the film Student of The Year on the occasion of five years of its completion and wrote, “#5YearsOfSOTY ….a film that gave me three solid life long relationships!!!! @S1dharthM @Varun_dvn @aliaa08”. The filmmaker is now planning a big project with the name Brahmastra which will be co-produced by Fox Star Studios and Namit Malhotra.